Thinking a flea market or antique mall might be the best place to sell your stuff? If you've got enough antiques, vintage items, or collectibles to fill a booth, you may be right. Many flea markets let you rent booth space just for a single weekend. 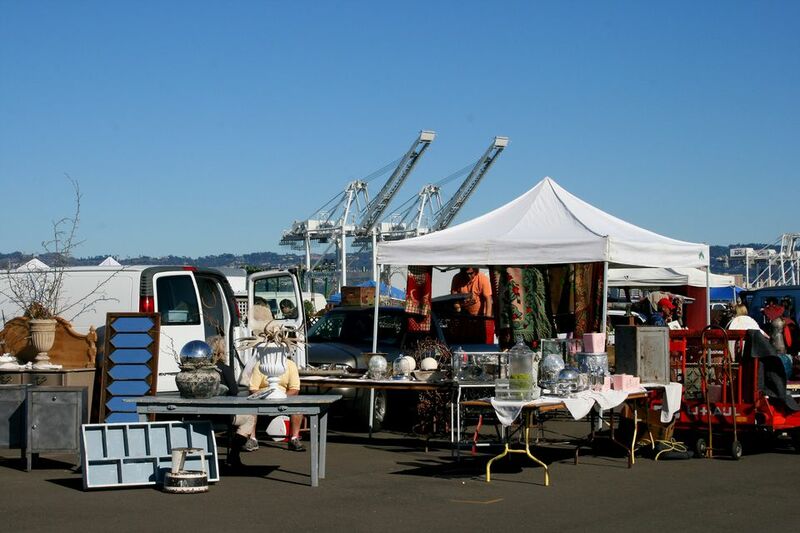 If you're constantly shopping for more treasures, you might enjoy renting flea market space regularly. Unless the flea market takes place every day of the week, shoppers realize they need to make a buying decision for the weekend sale event ends. Renting a flea market booth is ideal for a seller who enjoys chatting and haggling with her customers. If people tend to like you, spending face time with your customers works to your advantage. Shoppers want to buy from people they like. Unlike an estate or yard sale, renting booth space at a flea market means you don't have to have shoppers on your property or in your home. Unless you hire someone to work your booth, you do have to give up your weekends to run it. With a one-time booth rental, that's not too big of a deal for most people. If you plan to start a regular flea market business, you may be giving up your prime shopping time if you plan to fill it with estate and yard sale finds. Flea markets do charge for booth space. The cost depends on the individual flea markets. But, at well-trafficked and well-known flea markets, the booth may not come cheap. If you don't have a great sales weekend, you could end up paying for the privilege of selling your stuff. Many of the best flea markets have outdoor booths. In some parts of the country, you may get pretty hot during the prime flea market summer months. Unless you rent booth space at a permanent indoor flea market, you'll have to unpack, repack, and haul your goods each time the market opens. Don't go down on price too much during the morning of the first day of the flea market. That's when you'll have the most customers, so there's no need to give your goods away. Instead, offer a nominal discount. If the buyer doesn't bite, suggest he come back during the last couple of hours of the flea market's final day. You'll be glad to haggle rather than load it back up at that point, especially on big, heavy pieces. Tag your goods with prices. For one, shoppers don't want to ask you for prices on every single item that catches their eyes. For another, some shoppers may suspect you're tailoring the price to the amount you think they can afford -- especially if you actually are. Price your pieces a bit higher than the amount you hope to get. That leaves you some haggle room, which means you get your ideal price and the customer feels like he's gotten a deal. If you tag your goods with your rock-bottom price, you have no bargaining room. When you're setting up your booth, spend a little time making it look attractive. Though some shoppers don't mind digging, some do. Why not make your goods look good? You don't have to man the booth, which is ideal if you scout your new goods at the weekend estate and yard sales. You stock it and set up your display, and then leave. The antique mall employees take care of the money exchange part of the transaction. If you don't enjoy the haggling process -- and some sellers really don't -- you don't have to do it. If the customers can't see you, they can't ask for lower prices. Many antique malls open for business during the week, as well as on weekends. That's more opportunities for shoppers to find and fall for your merchandise. Don't opt for an antique mall booth unless you plan to replenish it regularly. Antique malls aren't suited for one-time sales. Because you don't man an antique mall booth, you're not on hand to answer questions about your merchandise when shoppers have questions. Because an antique mall doesn't have a built-in ending time like a flea market or estate sale does, your shoppers may not feel any urgency to make a buying decision. While they take their time deciding, they may spot pieces they like more than yours -- or they may just lose interest. You have to pay your booth rent regardless of your monthly sales. Many sellers end up losing money on a flea market booth during the slow months. Instruct the antique mall owner or manager to call you if a customer has a question or asks for a better price. Some antique malls also allow you to designate a percentage off to registered interior designers, or even just to anyone who asks. Don't set up your antique mall booth and forget it. As shoppers browse and buy, you pretty display may end up in disarray. Attractive booths attract more customers, so visit and freshen yours regularly.